It appears Ubisoft has decided to get into the wine industry a little bit as the company has partnered with Lot18 to make a series of Assassin’s Creed wines. The winemaker has takes some of their spirits and game them a special label, all of them having different ties to different games in the series. Here’s the official description of the line from the company. They work in the dark to serve the light, and now there’s a line of wines to honor them. 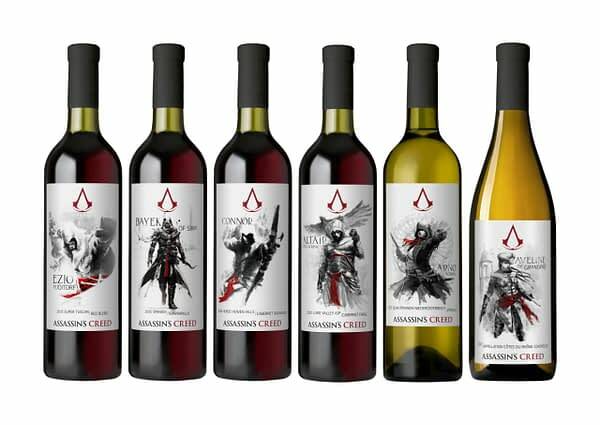 The Assassin’s Creed wine collection was created to highlight the stories of everyone’s favorite characters, including Ezio Auditore, Arno Dorian, Altaïr Ibn-La’Ahad, Aveline de Grandpré, Edward Kenway and Connor. You’ll get one of each in this half case. Stay your blade from the flesh of an innocent, hide in plain sight, never compromise the brotherhood, and always drink fine wine. You can currently purchase them on Lot18’s website, where depending on the amount you purchase you can get them at $16-20 per bottle.